VIENNA (AP) — A drawing based on information from inside an Iranian military site shows an explosives containment chamber of the type needed for nuclear arms-related tests that U.N. inspectors suspect Tehran has conducted there. 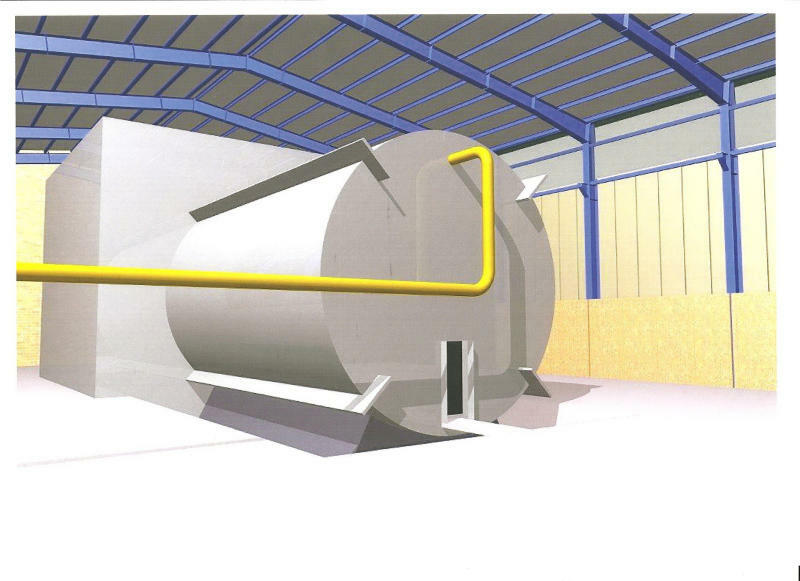 Iran denies such testing and has neither confirmed nor denied the existence of such a chamber. The computer-generated drawing was provided to The Associated Press by an official of a country tracking Iran's nuclear program who said it proves the structure exists, despite Tehran's refusal to acknowledge it. That official said the image is based on information from a person who had seen the chamber at the Parchin military site, adding that going into detail would endanger the life of that informant. The official comes from an IAEA member country that is severely critical of Iran's assertions that its nuclear activities are peaceful and asserts they are a springboard for making atomic arms. A former senior IAEA official said he believes the drawing is accurate. 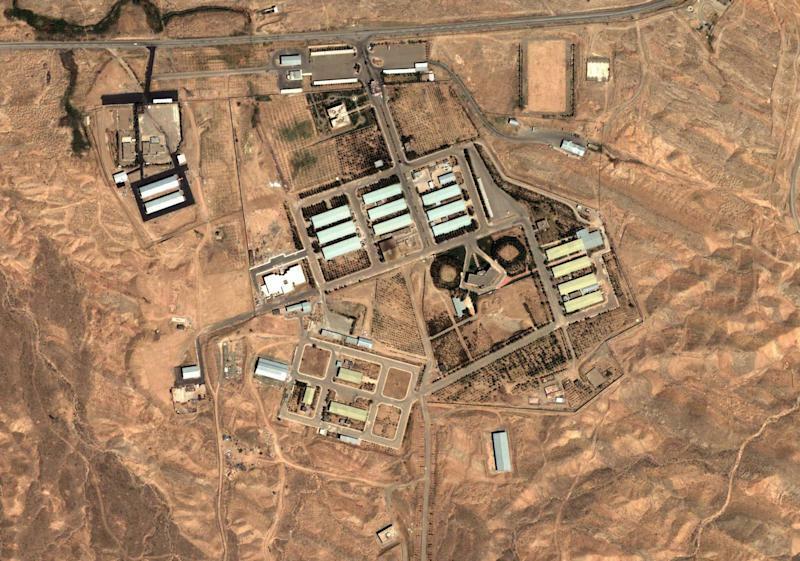 Olli Heinonen, until last year the U.N. nuclear agency's deputy director general in charge of the Iran file, said it was "very similar" to a photo he recently saw that he believes to be the pressure chamber the IAEA suspects is at Parchin. After months of being rebuffed, IAEA and Iranian officials meet starting Monday in Vienna, and the IAEA will renew its attempt to gain access to the chamber, allegedly hidden in a building. Any evidence that Iran is hiding such an explosives containment tank, and details on how it functions, is significant for IAEA investigations. Beyond IAEA hopes of progress, that two-day meeting is being closely watched by six powers trying to persuade Iran to make nuclear concessions aimed at reducing fears that it may want to develop atomic arms as a mood-setter for May 23 talks between the six and Tehran in Baghdad. Warnings by Israel that it may attack Iran's nuclear facilities eased after Iran and the six - the United States, Russia, China, Britain, France and Germany - met last month and agreed there was enough common will for the Baghdad round. But with the Jewish state saying it is determined to stop Iran before it develops the capacity to build nuclear weapons, failure at the Iraq talks could turn such threats into reality. In Tehran on Sunday, Saeed Jalili, Iran's top nuclear negotiator, said it was up to the Western nations coming to the Baghdad talks to "build trust of the Iranian nation," adding, "Any kind of miscalculation by the West will block success of the talks." The IAEA has been stonewalled by Iran for more than four years in attempts to probe what it says is intelligence from member states strongly suggesting that Iran secretly worked on developing nuclear weapons. It first mentioned the suspected existence of the chamber in a November report that described "a large explosives containment vessel" for experiments on triggering a nuclear explosion, adding that it had satellite images "consistent with this information." It did not detail what the images showed. But a senior diplomat familiar with the IAEA's investigation who has also seen the image provided to the AP said they revealed a cylinder similar to the image at Parchin. Subsequent photos showed a roof and walls going up around the cylinder that then hid the chamber from satellite surveillance. IAEA chief Yukiya Amano said in March that his agency has "credible information that indicates that Iran engaged in activities relevant to the development of nuclear explosive devices" at the site. Diplomats subsequently told the AP that the experiments also appear to have involved a small prototype neutron device used to spark a nuclear explosion - equipment that would be tested only if a country was trying to develop atomic weapons. Iran has strenuously denied conducting such work - and any intentions to build nuclear weapons - but has been less clear on whether the structure where it allegedly took place exists. The senior diplomat familiar with the IAEA investigations said the Iranians have refused to comment "one way or the other" on that issue to agency experts. He and others interviewed by the AP demanded anonymity because their information was privileged, and the official providing the drawing and other details on the structure also demanded that he and his country not be identified in return for sharing classified intelligence. Attempts to get Iranian comment were unsuccessful. A copy of the diagram was attached to an email sent to Ali Asghar Soltanieh, Iran's chief delegate to the IAEA, with a note that the AP would be asking for reaction. Subsequent phone calls over the weekend went to his voice mail. The technology used for the suspected multipoint explosives trigger experiments is similar to that employed in manufacturing tiny industrialized diamonds, and the IAEA believes former Soviet scientist Vyacheslav Danilenko - an expert in such diamond-making - helped Iran with designing the chamber. Diplomats say Danilenko has told the agency that he did not work on such a chamber, but his son in law, identified by the diplomats as Vladimir Padalko, told the IAEA that the container was built under Danilenko's direct supervision. Repeated attempts by the AP and other media organizations to contact the two men have been unsuccessful since the IAEA revealed Danilenko's suspected involvement in November. "What one does inside such a chamber is conduct high explosives testing," said Mark Fitzpatrick, director of the Non-Proliferation and Disarmament Program of the International Institute for Strategic Studies. "You are going to make something go boom with maybe 70 kilograms (more than 150 pounds) of high explosives, you need to contain the explosion. "And particularly if you are using uranium, which is reportedly the case, you want to contain all the uranium dust so there's not any tell-tale, observable signals of that experimentation." -Built in the early 2000s by Azar AB Industries Co. in the city of Arak and then transported to Parchin. Both the senior diplomat familiar with the IAEA investigations and Heinonen, the former senior IAEA official, confirmed this. Company officials did not answer calls seeking comment. -Volume: 300 cubic meters, or about 10,600 feet. Diameter: 4.6 meters, or 15.09 feet. Length: 18. 8 meters, or 61.68 feet. The senior diplomat confirmed the measurements. -A vacuum pump used to remove air from the chamber to minimize pressure that could damage the structure during an explosion; a compressor that shoots water into the chamber after testing to flood and clean it; a septic tank that receives the waste; an elevation system to suspend the explosives in the upper part of the chamber during testing; and a neutron detection system outside the explosion chamber to measure neutron emissions. The senior diplomat said these features would make sense, or such testing, but could not verify they existed, suggesting they may have been added after the Iranians put up the superstructure shielding the chamber from satellite surveillance. -The official said the chamber was used for detonation experiments in 2003, 2005 and 2006. Two officials familiar with the investigations said the first date appeared to be valid but they had no information of subsequent experiments. The United States believes Iran stopped working on a concerted nuclear weapons program at various sites after 2003, while the IAEA suspects Tehran is continuing some work but in a much less organized way than before 2003. -Seyed Ashgar Hashemi-Tabar, described as "an expert in measuring detonation phenomena" and not previously identified. Acting on information from the same official, the AP previously named other scientists allegedly involved as Fereydoun Abbasi, the current head of Iran's nuclear agency, who escaped an assassination attempt in 2010; Darious Rezainejad, who was killed by a car bomb last year; and Reza Ibrahimi. Inspecting the site at Parchin, southeast of the capital, Tehran, was a key request made by senior IAEA teams that visited Tehran in January and February. Iran rebuffed those demands and subsequent ones - the most recent within the last two weeks - as well as attempts by the nuclear agency to question Iranian officials and secure other information linked to the allegations of secret weapons work. At the same time, the IAEA has voiced alarm at unexplained "activity" at the site - a term diplomats familiar with the agency's concerns say stands for attempts to clean up any evidence of the kinds of experiments the agency suspects were carried out. A second senior diplomat familiar with the investigation recently told the AP that spy satellite images shared with the agency show what seems to be water streaming from the building housing the chamber. He said it also depicts workers removing bags of material from that building and put on vehicles outside. A third senior diplomat said that the apparent cleanup was continuing in early May, the last time he had seen the images. Iran has scoffed at suggestions of a cleanup in general and of testing a neutron device in particular, with Foreign Ministry spokesman Ramin Mahmanparast asserting that nuclear contamination cannot be washed away. But experts challenge that assertion. A cleanup "could involve grinding down the surfaces inside the building, collecting the dust and then washing the area thoroughly," said David Albright, whose Institute for Science and International Security in Washington looks for signs of nuclear proliferation. "This could be followed with new building materials and paint. "It could also involve removing any dirt around the building thought to contain contaminants," Albright said in a statement emailed to selected recipients. "These types of activities could be effective in defeating environmental sampling." "In the past, the IAEA has been able to catch out Iran by going to a building that Iran tried to clean and they still found traces of uranium," he said. "And Iran learned from that and they learned that 'boy you have to scrub everything really clean; get down into the drains and grind away any possible residue.'"